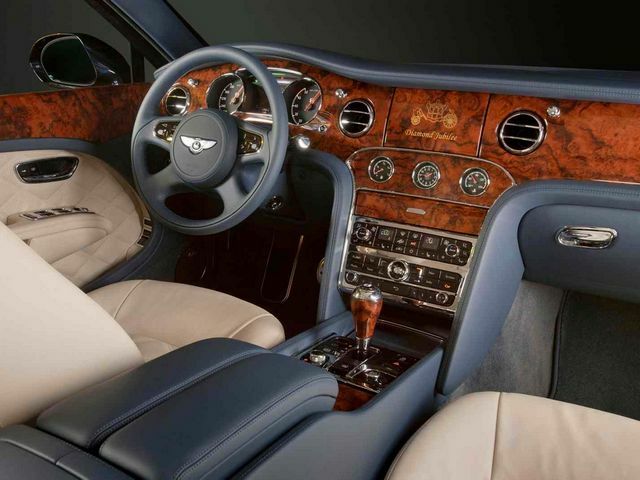 A view of dashboard in Bentley Mulsanne Diamond Jubilee Edition 2012, specially created by Bentley Motors with ultra luxury interior crafted by Mulliner, to celebrate the birthday of Britain's Queen Elizabeth II and 60-th anniversary of her reign. There have been made just 60 cars in this serie, with a standard Mulsanne twin-turbocharged 6.75 litre V8 engine, wich develops 512 hp at 4,200 rpm and a 1,020 Nm of torque at 1,750 rev/min. That ensures for the massive luxury limousine an acceleration from 0 to 100 km/h in 5.3 seconds and a top speed of 296 km/h.